Uber Select is a step above the normal everyday car. This is where you start going from everyday vehicles to entry-level luxury cars. There aren’t as many on the road, and fares are much higher than the UberX, but still shouldn’t kill your wallet if you decide to be a passenger instead of a driver. Below we discuss what the Uber Select car requirements are, and what else you need to know about driving for Uber Select. Uber Select, also known as Uber Plus in some areas, is the beginning of luxury cars on the Uber platform. The cars look nicer, the fares are higher, and you’re not competing with as many Uber drivers for that “next” ride. While I will always recommend starting off on UberX, Uber Select is a great option for those who already have good looking, comfortable cars to drive in. This the platform where you will start seeing more people with Audi’s, BMW’s, and Mercedes Benz’s picking you up instead of some Toyota Prius. One of the most asked questions I’ve been receiving is, “How do you become an Uber Select driver if your vehicle qualifies? You must complete 50-100 trips as an UberX or UberXL driver. You must maintain between 4.7-4.8 driver rating and maintain it. Aim for 4.8 to be safe. Once you complete steps 1-3 Uber should upgrade you automatically to receive Uber Select request. If they don’t send them a message. As long your car qualifies in your city it should be pretty easy to complete these steps. One thing to note: Depending on the city you drive in, you will also be required to maintain an 80% acceptance rate or above. 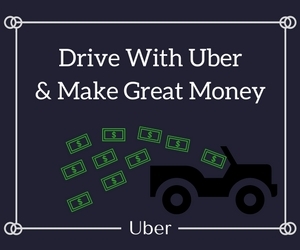 You can become an Uber driver in these three easy steps. Each Uber service has a different set of car requirements. Uber Select is where Uber really starts getting more picky about the car requirements, but there are still plenty of cars to choose from to drive on this ride-sharing platform. You must Have a U.S. Driver license for at least a year. You must have an in-state Drivers License. * Car year requirements vary by city and are subject to change at Uber’s discretion, and Uber Select may not be available in all markets. While this isn’t high-end luxury driving, it is still a step above the rest. Your vehicle must meet slightly stricter requirements and they are more expensive vehicles to drive. While eligible cars can slightly change city to city, I have compiled a list of qualifying cars for the San Francisco and Los Angeles market. Most vehicles should qualify in other markets as well, but double check with your local Uber support team to be sure that your car does qualify. Below is a list of all the eligible Vehicles that I have found. Some vehicles that are eligible must be a certain year or newer. Eligible vehicles are subject to change at Uber’s discretion and can vary depending on the city. Those are the car requirements for being an Uber Select driver.